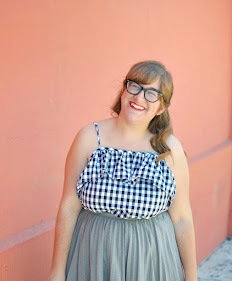 I'm posting on Flock Together today about Erica of Sweets and Hearts' lovely top, so follow me over there to take a look. To entice you even more: I may or may not resemble a Disney princess in this post and I'm also debuting you incredible Dear Creatures dress. See you there! And make sure to enter my Firmoo glasses giveaway! I'm giving away 20 $20 vouchers so you have a good chance of winning! I love this look....okay, heading to Flock Together Now! and that dear creatures dress--SO PRETTY. thanks so much for stopping by Thread.The.Needle- got I found your blog! Such an adorable combination! By the way, thank you for leaving a sweet comment on my blog. I really like yours as well and will start following you now. Seriously, can you be any cuter?! Ooh I am definitely going to have to check out that post. Loving this cute pic of you! That dress is super duper cute. ANything with a collar, I dread the day when collars are off trend. I think I will just continue to wear them. Just like a dread the day when high-waisted skirts are out again. Argh!